Greg Bird's grand slam highlighted a six-run first inning as the Yankees completed the three-game sweep. The Yankees almost had a good day. But a grand slam by the suddenly rejuvenated Greg Bird, a fourth consecutive victory by starter J.A. Happ and a three-game sweep of the Blue Jays in which they scored 28 runs did not warrant a smile from Aaron Boone. The manager had potentially disconcerting news after the 10-2 triumph at Yankee Stadium. 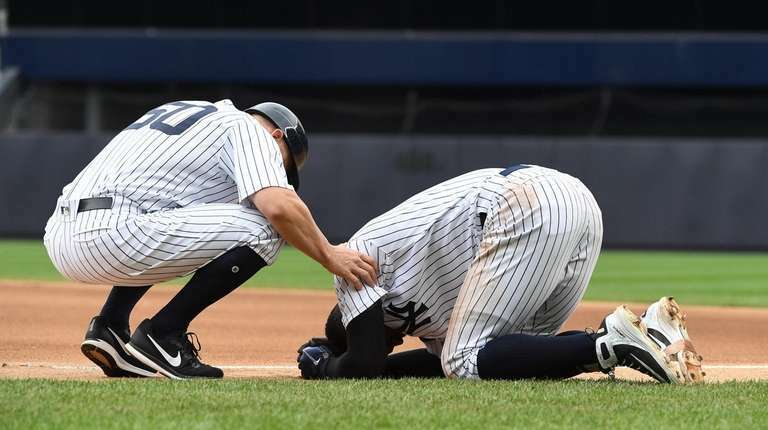 Didi Gregorius, who left the game in the second inning after a nasty collision with Blue Jays first baseman Kendrys Morales in the Yankees’ six-run first, suffered what Boone termed “a pretty bad bruise” on his left heel. With the score tied at 1-1 after Miguel Andujar’s RBI single in the first inning, Gregorius pulled a grounder into the hole. Second baseman Devon Travis’ off-balance throw from shallow rightfield forced Morales toward foul territory and into the path of Gregorius, who had nowhere to go. After they collided, he flipped over Morales’ right side and spun to the ground. Gregorius — who was not made available after the game — wound up with an RBI infield single and scored when Bird hit the second bases-loaded home run of his career. It traveled 386 feet and landed in the second deck inside the foul pole in rightfield, giving the Yankees a 6-1 lead. It was their fourth straight hit after Blue Jays starter Ryan Borucki — who didn’t record his first out until his 37th pitch — walked Aaron Hicks and Giancarlo Stanton to start the game. It was the first time in more than 21 years that the Yankees scored six runs six batters into a game, and it was all they needed to move 32 games over .500 for the first time since the end of the 2011 season (97-65). Boone said Gleyber Torres will play shortstop in Gregorius’ absence, with Ronald Torreyes (three hits) and Neil Walker splitting time at second. If Gregorius goes on the DL, Tyler Wade likely will be called up and take on a utility role. Boone hopes Stanton, who has been the designated hitter while playing through a tweaked hamstring, can return to the outfield this week. The Yankees still do not have return dates for Gary Sanchez and Aaron Judge. And now, maybe for an extended period without their shortstop.